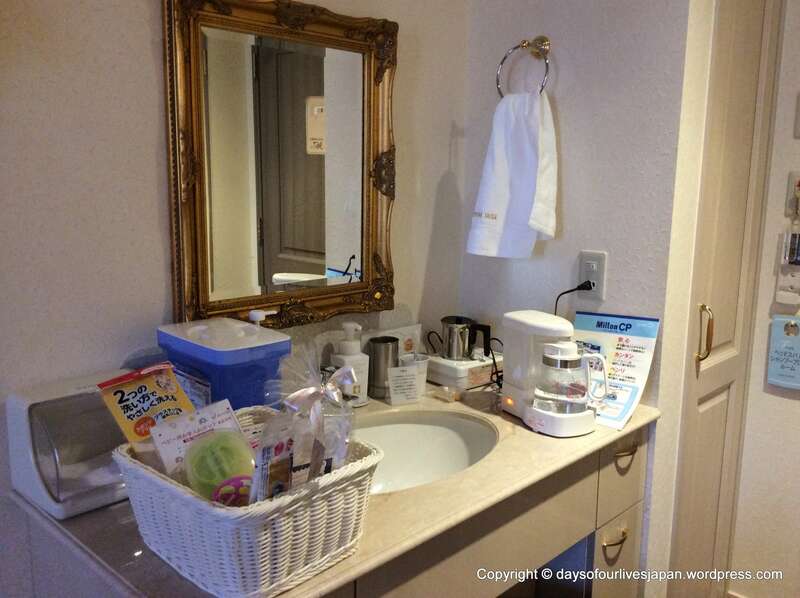 Some photos of the food and the goodies on day one of a standard five-day stay (birth day is counted as day zero) in a Japanese maternity hotel… I mean hospital! Breakfast, which was brought to my room the morning after I gave birth. Little one #4 was in the baby room, where you bring your baby each mealtime to be watched, so you can relax over your food. Lunch, which I had in the Fuji View Restaurant on the 4th floor. This is where you have all your meals during your stay, once you have had a 24 hour rest (48 hours for caesarean sections) after giving birth. This lunch was an “Oriental Plate” prepared by the chef teppanyaki style. There was a little Halloween ornament on the table for every meal during the stay, which I thought was a nice touch. Here it is pictured with the delicious dessert. Dinner was Kyoto style food. Kyoto is a region in Japan. 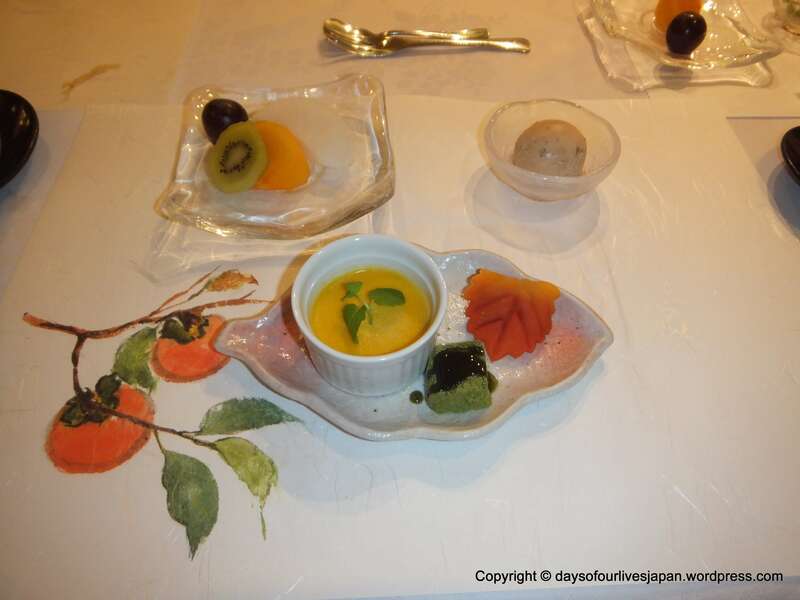 I don’t normally like Wagashi , but this was absolutely gorgeous, not to mention beautifully presented. Meanwhile back in the room, I was enjoying more freebies. These goods are for the baby. Everyone is provided baby milk powder, a bottle, a brush to wash the bottle, milton tablets and other bits and pieces so you can prepare a formula bottle if you choose to bottle feed or supplement for the first few days. Second photo shows the vanity area where the goods were presented. The large milton sterilising box, the bottle keep, the kettle, the pot and the washing up liquid belong to the hospital, but are provided in each room throughout your stay. Congrats on the new addition! And what pampering! This is how it should be everywhere. 🙂 hope you and baby are doing well! I agree – it all looks so civilised! Definitely better than my ham sandwiches and apple after giving birth, though I could have had dinner in my room if I’d wanted it, and I don’t know what that was. I really wish it could be like this everywhere too. It is such a special occasion anyway, without any trimmings, but the comfort and extras really add to it all and possibly reduce the chances of baby blues and PND. My wife also ate such great dish. It’s really like a hotel. Your wife also went to Keiai? I don’t think I knew that. Awesome. 🙂 Its very popular in the area. Congratulations! You made it! Welcome #4. Looks like a 5* maternity hotel there! It definitely deserves 5 stars! This looks awesome! This should be the norm everywhere! I think that too. I really do. I have thought about ways to introduce it in Ireland, but I don’t think it could work anywhere else but Asia. There are places like this in THailand and Korea too, supposedly.